Camera: Canon EOS 50D; Lens Canon EF 400mm f/5.6L USM; Shutter speed: 1/2000; Aperture: f/5.6; ISO: 400; Exposure compensation: +0.7. The above photo was taken in mid-winter in Mashatu Game Reserve, a private wildlife sanctuary within Botswana's Northern Tuli Game Reserve. While the topography and vegetation is varied, in winter some parts of Mashatu can look extremeley stark and this occasion was worse than usual as there'd been no rain for many months. 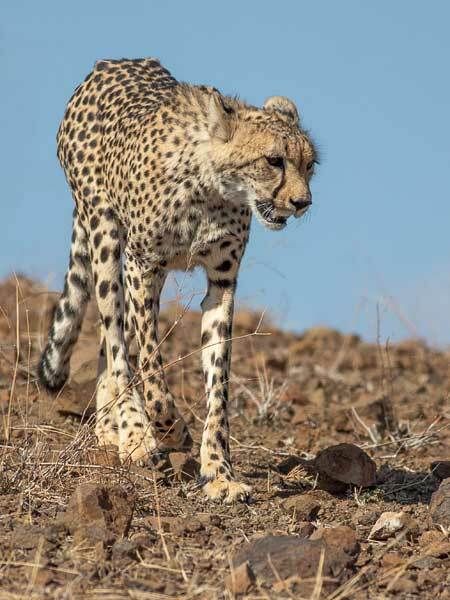 Yet even in this harsh environment, the animals seem to survive and we saw a number of cheetah. These cats thrive in more open terrain as they hunt by day, relying on vision to locate prey. Once a potential victim is identified, the cheetah will stalk till fairly close, then sprint in for the kill.